By wearing a band-aid and writing the name of a child who has been helped by Penn State Children’s Hospital. Take a photo and share it on social media with the hashtags #CMNHershey and #ChildrensHospitalsWeek. By making a donation at org/CHW19. 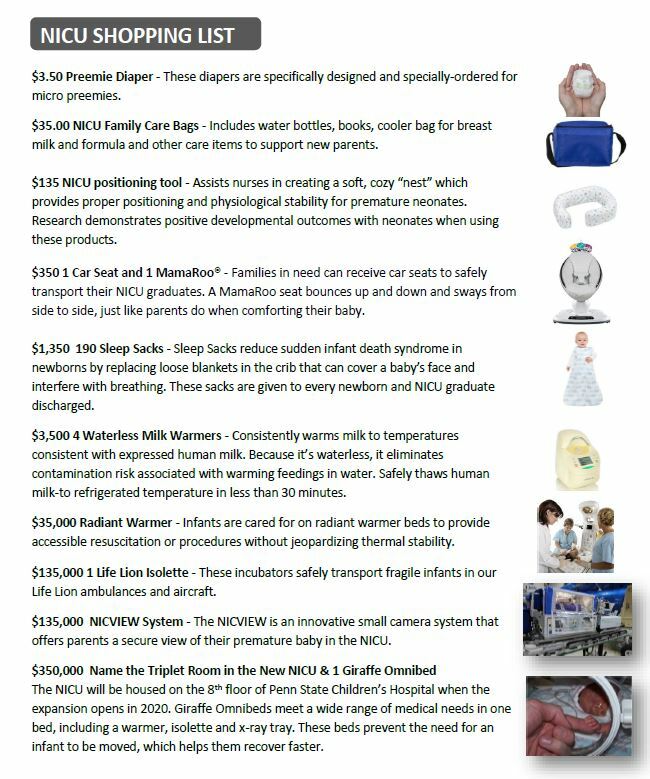 Gifts will be designated to the hospital’s Neonatal Intensive Care Unit (NICU) to fund family-centered programs and equipment like isolettes, incubators and preemie care items. Up to $20,000 in online donations will be matched by Johnson Controls, Inc and Universal Media. Construction is currently underway on a new, 56-bed NICU at Penn State Children’s Hospital. To kick off Children’s Hospitals Week, CMN Hershey will host a Miracle Party for current and former pediatric patients on Monday, March 18 from 2:30 to 5 p.m. at the Turkey Hill Experience in Columbia, Lancaster County. The children will participate in various Turkey Hill activities including making their own ice cream. They will also receive toys and gift cards donated by York County Harley Davidson Owner’s Association. Media are welcome to attend. In addition to support from national celebrities including Kristen Bell and Marie Osmond, numerous businesses and individuals are also supporting Children’s Hospitals Week via fundraising campaigns, events and social media. They include GIANT Food Stores, Miss Pennsylvania, WGAL-TV8, Cumulus Media Inc., Speedway, Fun 101.3 FM, Love’s Travel Stops, 445 Foundation, Walmart Inc., Garret Lauer Events, Harrisburg Senators, Hershey Entertainment & Resorts and the Hershey Bears, Ace Hardware, Courtyard by Marriott in Hershey, JPL, Shollenberger Januzzi & Wolfe, LLP, Whiting-Turner, REMAX, High Construction Company, BraveCubs, Dairy Queen, Renewal by Anderson, The Hershey Company and the NICU staff at Penn State Children’s Hospital.